Early Bird Pricing and What’s New for this fall? 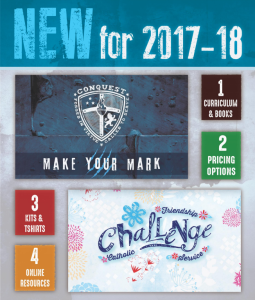 Challenge and Conquest announces the SPECIAL EARLY BIRD PRICING for the 2017-18 Annual Membership renewals! $100 discount by pre-registering before July 1st! $50 discount for pre-registering by July 15th! We are also very excited to inform you of the new improvements for this fall, as well as announce no price increases, but rather pricing decreases for our team leader kits and curriculum! You can find out about what’s new by clicking on the picture on the left or HERE. There is also a list of helpful FAQ’s to answer questions you many have, or you can contact us anytime. The Challenge and Conquest online store should be open by mid-July. All those pre-registered will receive an email notification at that time.